1894—The history of the St. Paul Lutheran congregation had its beginning in 1894, when a small group of Lutherans began holding services in a small public school in Johnson township. Area pastors came and served them, particularly the Rev. Kleinlein, pastor of Christ Lutheran Church of Grant township. 1896—Under the guidance of Pastor George Finke of LeMars, this small group was organized into a congregation the fall of 1896. There were eight charter members together with their families, including Gerhard Von Hagel, M. Mammen, Hinrich Siebels, Gottlieb Lehmann, G. Jaster, S. Dennler, Harm Fischer and H. Rolapp. Though small in number they planned and built their own church which was dedicated the following year, 1897. 1898—The first resident pastor, the Rev. C.F. Christiansen, accepted the call of the congregation. In 1900 the first parsonage was built. 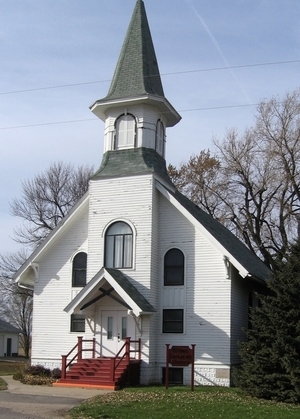 Pastor Christiansen continued to serve the congregation until 1904. 1904—The Rev. F.W. Gebhard accepted the call. He served for four years until 1909. During his ministry an addition and a church steeple was built and a bell added. 1909-1912—The Rev. J.J. Roesch was called and served until October 1912. 1912-1917—The Rev. William Striepe became the next pastor. During his pastorate, the Ladies Aid and the Luther League were organized. He received a call and was released from this parish in 1917. 1917-1953—The Rev. Gustav Meyer became pastor of the congregation following Pastor Striepe. It was during his ministry that the language question became urgent. This was true throughout the Christian Church in America. On April 7, 1918, it was decided to have one English service a month. Later it was increased to 2 and to 3 a month. Finally, in 1941, the German language was dropped entirely. 1923—A new house of worship was built. Improvements followed during the next few years. 1936—A tragedy occurred when a fire destroyed the parsonage. They proceeded to rebuild. Credit was given to the women for much of the support for this project. 1946—The congregation celebrated its Golden Anniversary. It had now grown from a small handful of members to a total of 204 souls and communicant membership of 170. 1948—The congregation observed the 25th Anniversary of the new church building. On June 28, 1953, Pastor Meyer preached his farewell sermon after 36 years of faithful and fruitful service. 1957—On December 18, a special meeting of the congregation was held with the District President, Dr. Siefkes, to consider possible alignment with the St. Peter congregation of Brunsville, to form a 2-point parish, sharing one pastor. The plan was approved and the St. Paul congregation furnished the parsonage and utilities. On April 7, 1958, it was agreed to allow the pastor to choose the parsonage he wished to live in. 1958—On October 26, Rev. Ewald Senst gave his farewell sermon. 1958-1964—On November 9, 1958, the Rev. Cyril Jandrey was installed as pastor of the St. Paul and St. Peter Parish. He chose to live in the St. Peter parsonage in Brunsville. On November 30, 1964, Pastor Jandrey preached his farewell sermon. 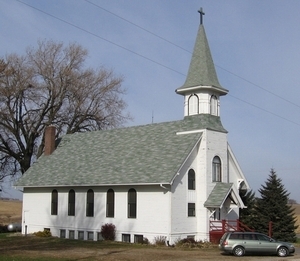 Pastor William Funk of St. John Lutheran Church, Merrill, served as interim pastor until March 1965. 1965-1966—Pastor Clarence Nagel was installed as pastor of the parish in March of 1965. In September, 1966, Pastor Nagel resigned and moved from the parish. Pastor William Funk of Merrill again became the interim pastor. Pastor James Sandvik and Pastor Dennis Mueller also assisted in providing services. 1967-1972—On June 30, Pastor and Mrs. Olaf I. Rossing moved into the St. Paul parsonage, Merrill. He was installed as pastor of the parish on July 9, 1967, and continued to serve until July 1972. During his ministry improvements were made, and the 75th Anniversary of the congregation was celebrated. 1972—On July 12, Rev. Robert H. Salge arrived in the parish, and with his wife Kathryn moved into the St. Paul parsonage. On August 6, he was installed as pastor. He has continued to serve the parish up to the present time. During his ministry, the 50th Anniversary of the present church building was noted, a new furnace installed, and entire interior redecorated. At the present time, on the 80th Anniversary of the congregation, the membership consists of 136 baptized members and 112 confirmed.